Below are some more of our feed products, if you have any questions please call: (931) 484- 2937. 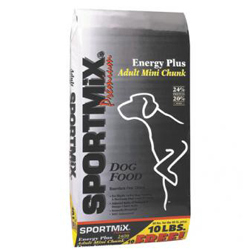 SPORTMiX® Energy Plus Adult Mini Chunk 24/20 is formulated for highly active dogs needing a maximum high level of energy. Dogs participating in competition events demand a food that will allow them to withstand days of grueling field trials. This formula is designed to meet the needs of these high stress working dogs. Formulated with supplemental flaxseed, SPORTMiX® Energy Plus Adult Mini Chunk helps ensure an improved Omega-6/Omega-3 fatty acid balance promoting a healthy skin and coat. 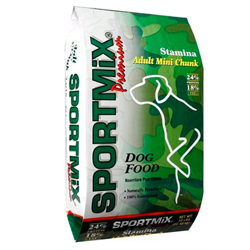 SPORTMiX® Energy Plus is naturally preserved and has a taste dogs love. 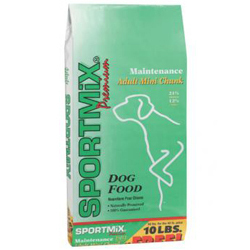 SPORTMiX® Maintenance Adult Mini Chunk 21/12 is formulated for adult dogs who require a lower level of energy and protein due to their activity level or living environment. The selected high quality ingredients used in SPORTMiX® Maintenance provide digestibility and energy without the use of extra protein. This special balance of protein, fats, vitamins and minerals promotes strong muscles and bones and glossy coat and delivers a taste that dogs love. 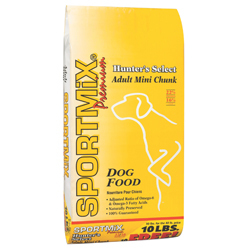 SPORTMiX® Hunter’s Select Adult Mini Chunk 22/16 is formulated for adult dogs that require lower protein due to their everyday living environment, but higher fat levels for increased seasonal or intermittent activity levels. SPORTMiX® Hunter’s Select is formulated with supplemental flaxseed which helps ensure an improved Omega-6/Omega-3 fatty acid balance promoting a healthy skin and coat.